A few hours ago, Turkish Authorities released a report detailing their interception of another shipment of arms from Iran, on its way to Syria. It’s unclear whether the final destination was to Syria, or to Hezbollah in Lebanon, but it is clear that the Iranian government is on the side of the Shia Syrian President Bashar al-Assad, ruling over a Sunni-populated country. Ever since the rise of the Islamic Republic in Iran, Syria has remained a close, if not their top ally. The US, as many other Arab countries believe that Iran is helping Assad with his crackdown on protesters, because they can’t afford to lose such a strong ally from the Arab world. Perhaps one of their only allies from the Arab world. Shia and Sunni tensions go all the way back, from the debate on who should succeed the Prophet Mohammed. Now, it’s swayed from being about religious differences and instead more toward political differences that are shaped in the form of borders. Around 90% of Shia Muslims, who only constitute 10% of the Muslim population in total live in Iran, with the remainder 10% of Shias mostly living in Iraq. The Islamic Arab, African, and Asian countries are Sunni. It’s understandable why the Shia Islamic Government of Iran found an ally among the Shia Syrian government, just as they did behind the Shia government in Lebanon. I can speak on behalf of a lot of Shia Muslims when I say that in May I didn’t believe in the brutal crackdown happening in Syria by Assad. Like many of the Shia Syrians here, I believed it was a smear campaign to quell another Shia leader among a Sunni majority. My perception quickly changed thanks to social media. When you have thousands of people posting videos, pictures, and writing about the crackdown in Syria, you can’t pretend it doesn’t exist. And for that same reason, that’s why I’m blogging about Syria. The Blog4Syria Campaign starts today. The US estimates that Assad’s forces have killed already 2,000 protesters since the uprising started. There have been videos posted on Youtube of men, women, and even children being killed by his brutes. The “Syrian Intifada” naming themselves after the Intifada that took place in Palestine in response to the Nakba, or Arab Catastrophe that left tens of thousands of Palestinians dead, have made a youtube channel with some of the most violent videos of the crackdown . As every journalist, and blogger says, “These individual videos cannot be verified because the Assad government has prevented foreign news media from documenting the protests”. God bless, there are individuals willing to risk their lives to make sure the world sees what’s happening. Ramadan began 5 days ago, on August 1st which also marked the beginning of what is becoming known as the “Ramadan Massacre“. In a single day, local Syrian activists claim that upwards of 150 protesters were massacred by Assad’s police force in the city of Hama. In 1982, Assad’s father ordered an assault that killed tens of thousands of protesters as well. Syrians are beginning to see the mask come off from what critics said was the “weak” Assad, and beginning to look more like his father. The assaults have escalated since August 1st, with state television claiming the assaults were in response of an armed rebellion. 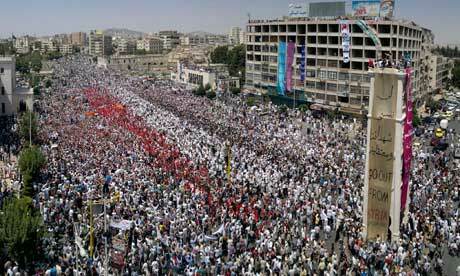 Today, after noon prayers Syrians have taken to the street to once again stand up against Assad. Although the US showed strong interest in helping the rebels in Libya take down Muammar Qaddafi, they have simply condemned Assad and disconnected ties with the government. the EU and the US have put sanctions on the Government, but they obviously have not been enough. Leaders are entertaining the idea of putting sanctions on Syria’s oil and gas sector, but those actions haven’t materialized as of today. On Wednesday the UN voted to condemn the crackdown in Syria, but they have not taken actions to isolate the Assad regime. Until more international pressure is exerted, Assad will continue to massacre. As Shias, we can’t continue to support leaders who kill their own people for the sake of their own power. I’m a Shia not willing to protect the Shia Government that is Assad. I hope more people can join me. ← Mosalama, Doha. My Sarah Warren moment.